Plans by the government to collect land and buildings tax, aimed at narrowing social disparities and enabling the state to collect more taxes, are postponed to an indefinite period because people are still suffering from the general economic slowdown in the country, Prime Minister Gen Prayut Chan-o-cha reiterated Friday, March 13. However, the majority of people are still suffering from prevailing economic woes, therefore, the plan has to be delayed for a certain period and the government will now have to inform the people on how the government spends the tax money on developing the country. Tax money is part of government’s revenue and the collection is about 10 percent of the total, he said, adding that the government will adjust tax collection, especially from the rural area and the rural administrative organizations will be asked to be responsible. If they could manage, it would save the state budget by as much as Bt260 billion annually. 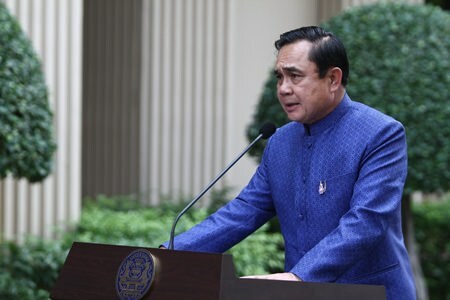 Currently, tax collected from rural areas is more than Bt70 billion annually only and if the collection continues declining and the central government will have to support it, the revenue of the central government would fall and eventually affect its investment, said Gen Prayut. He did not say how long the review on the tax system would take while stressing that tax collection in Thailand is now very low.